My girl Aspen will have her back leg amputated this week. Her knee was shattered by a bullet when she escaped our property. She was missing two weeks and came back nearly starved and infected because of the wound. Now that she’s a bit better/stronger, it’s time for the surgery. The emergency vet told us that if amputation was needed, it would probably be done at the joint (hip), however our regular vet plans to cut the bone between the hip and the knee. While I understand that this will give her better balance, to my layman’s mind, it seems much more painful and invasive. Could I hear from a couple of different views? Aspen and family, welcome. We’re so sorry that you have to be here. It is truly miraculous that she survived, what a truly strong warrior you’ve got there. Partial vs. Full Leg Amputation for Pets, What’s Better? I’ve had two rear amp pups, each had a different type of amputation. My first, Maggie, was a pug who lost her left rear leg to mast cell cancer. She had what was called a mid-femoral amp, which is a bit of a misnomer in my mind as only a small piece of the the femur was left. The ‘stump’ was wrapped with muscle and could not be seen although you could feel it. You could see the muscle moving when she moved her stump. Although her prognosis was poor Mag lived almost 4 years post amp and never had any issues with her stump. My current Tripawd is a pug mix, Elly, who was hit by a car at 7 months old and lost her right rear leg as a result, her amputation took her entire femur. Elly is now just over 2 years old so has been on three for almost a year and a half. In my opinion the mid-femoral amp is by far the better surgery (assuming only a small piece of the femur is left). Maggie had a good sitting base and was more comfortable sitting on hard surfaces. Elly’s hip bone is very prominent and she will not sit on hard surfaces, she does not have a good sitting base. Elly is young and very strong and has excellent balance- we work on her strength and balance every day. Maggie was a lazy pug who was older at the time of her amp, 7.5 years old, but I think her balance was intrinsically better than Elly’s. Mag’s gait seemed smoother too, but since I can’t really compare them side by side I can’t prove that. I do remember discussing the type of surgery before Maggie’s amp with the surgeon. He said that the mid-femoral was an easier surgery and that the surgery would be faster and easier on Mag. Honestly I don’t think I really had a hand in deciding what type of surgery- I was pretty overwhelmed with the thought of amputation and the cancer diagnosis. I adopted Elly 2.5 months after her accident and surgery so I wasn’t in on that decision either. I had this conversation with The Oak Town Pack a couple weeks ago- they have 3 rear amp GSDs. We agreed among ourselves that we would choose the mid femoral amp if it ever came up in the future. You could PM Martha and ask for her opinion- she posts as Codie Rae. What day is surgery? Good luck! Our Murphy also had a mid-femoral amp covered by a good amount of muscle. It never gave him a bit of problem. Unlike Maggie, we never noticed the stump moving, as his amp was due to nerve damage caused when he was hit by a car. He was always able to sit squarely. 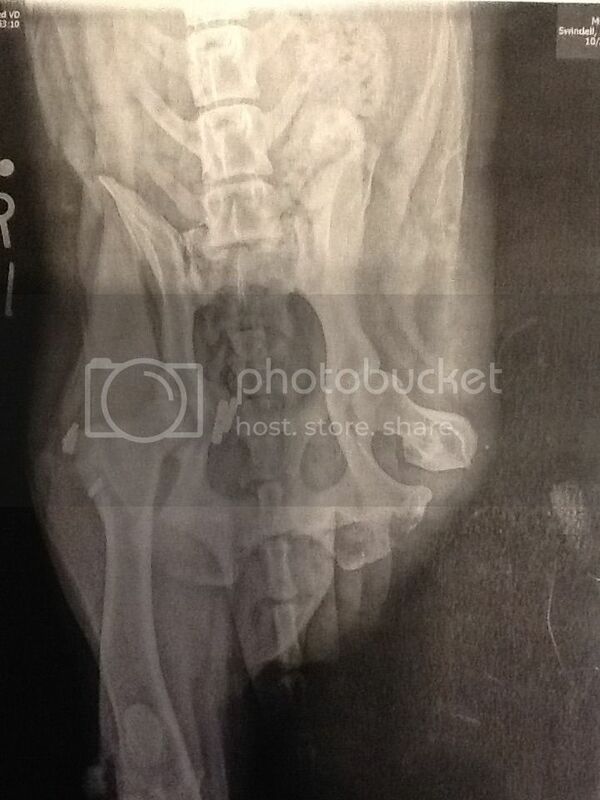 Here is his x-ray, taken before the hip replacement, that shows how much (or how little) of the femur was left. So any update? When his her surgery?